Our best drill index set! Excellent for stainless steel and other hard metals. 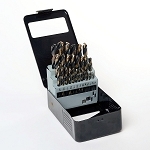 Professional 29 pc drill index set covering sizes from 1/16 in. to 1/2cin. by 64ths. The drill bits are made from a special HI Molybdenum tool steel. 135º split point tips for fast penetration. Precision ground points, flutes, body, clearance and drill diameter for the ultimate in accuracy and performance. 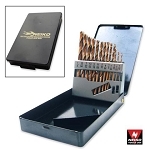 Drills are gold surface treated for maximum lubricity and inside the flutes the bits are black. 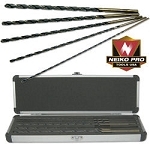 Drills are surface treated to 2185° degrees and then nitro carbonize finished at 950°. 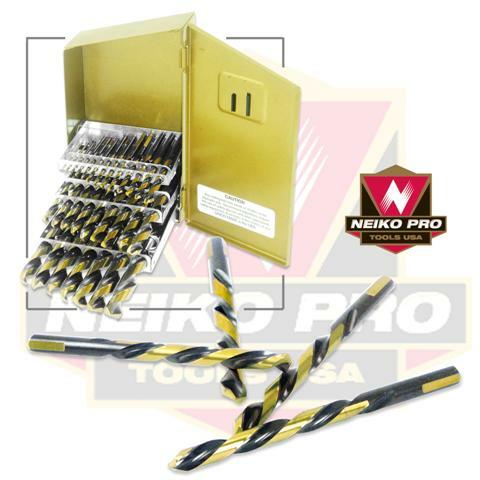 Great for work hardening grades of stainless steel and other hard drilling applications. Vastly superior to any cobalt drill bits. Shanks on the larger bits have three flat sides so the bits will not spin in the drill chuck.